The 240 by 100 foot brick industrial building was formerly used in shipbuilding, but it is now the futuristic looking home to dozens of rescued and endangered sea turtles, [Note: The number of sea turtles now convalescing in Quincy has drastically increased! Get the latest on patient counts on the Rescue Blog.] a school of cownose rays, and a nursery for nine baby bonnethead sharks. The New England Aquarium tonight will host an informal open house for trustees and donors of its new Animal Care Center in the Quincy Shipyard. 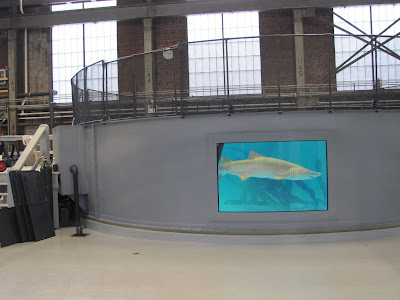 The new $3.7 million facility is the new state of the art, private, offsite holding facility for the Boston aquarium. Left: A sand tiger shark swims in a holding take. 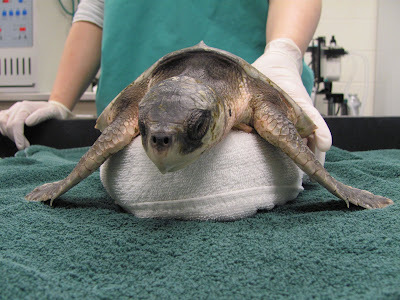 Right: A rescued sea turtle rests on a towel while being examined. The New England Aquarium is located on Central Wharf in dense, downtown Boston where it dedicates as much space as possible for exhibit and visitor uses. There had been a desire for an off-site holding facility for rescued marine animals, animals in quarantine and for animals that were arriving for later display. After a year long search, the Aquarium came to an agreement with Quincy Shipyard owner Jay Cashman to renovate one of the old fabrication plants in the stories South Shore shipyard. 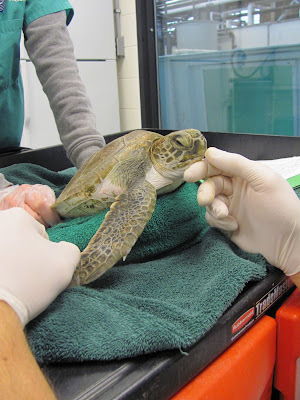 Construction began in September 2009 and is still ongoing, but the new facility is nearly up to full operations with the onset of the cold stunned sea turtle stranding season on Cape Cod. Thanks for your interest in volunteering at the Aquarium! We have a lot of opportunities for people who want to learn about marine animal, how to care for them and how to protect them in the wild. Contact our Volunteer and Internship office via email at vols@neaq.org and on the telephone at 617-973-5235.